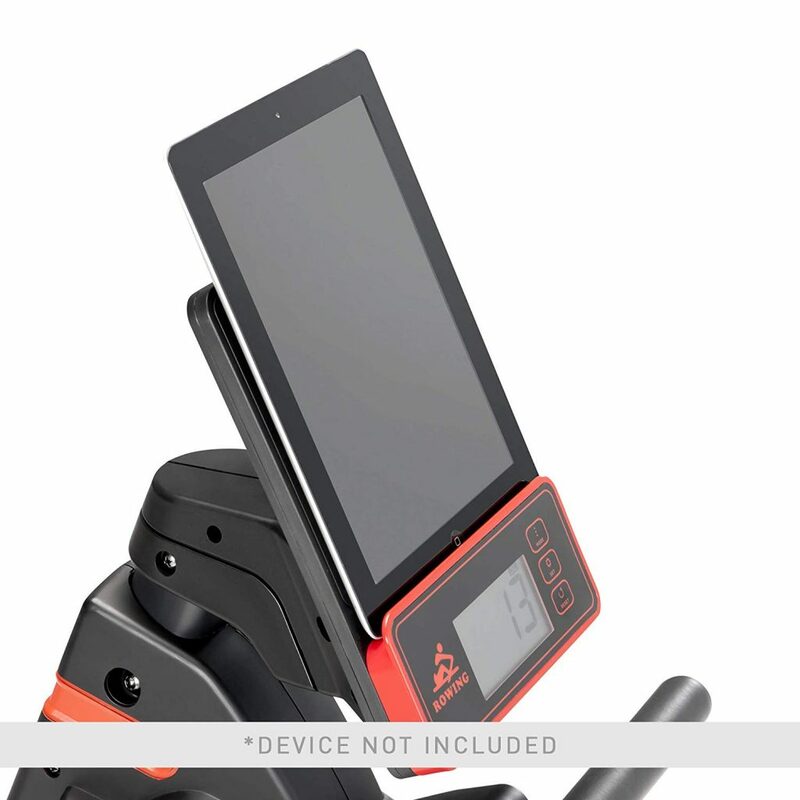 Circuit Fitness AMZ 979-RW is a modern magnetic stationary rowing machine with a 9-pound flywheel and a foldable design for both cardiovascular and resistance training. It is rated 4.2 out of 5 stars by 6 customers at the time of this product review, as one of the hot new release rowing machines. You can burn calories and fat, strengthen and tone muscles of your lower body, core and upper body and increase your endurance with this great rowing machine. If you do not have very high expectations this recent release unit should satisfy your needs for a daily cardio and light strength training in the comfort of your home. It is a great little rowing machine for the price. It comes with a small user-friendly LCD display with the standard stats of calories, distance, time, total count and rpm. There is no heart rate sensor and no indicator on the display. The mould injected seat with contoured foam pad is sturdy and durable with an ergonomic design for your comfort during your exercise session. The two fixed pedals are anti-slip with a textured surface for your comfort and safety, with also the adjustable velcro foot straps to keep your feet in place. The pedals are good for people with different foot sizes. The Circuit Fitness Rower weighs 72 pounds with a 300 lb. user weight capacity and measures 72 x 38.5 x 19 inches – is compact in size taking up very little space in your workout area. It has a foldable design with a quick-release pin, a foldable monitor and the folded measurements of 36L x 19W x 53.5H inches. You can move it easily on its two integrated wheels and store it in a convenient part of your house when you’re not using it. 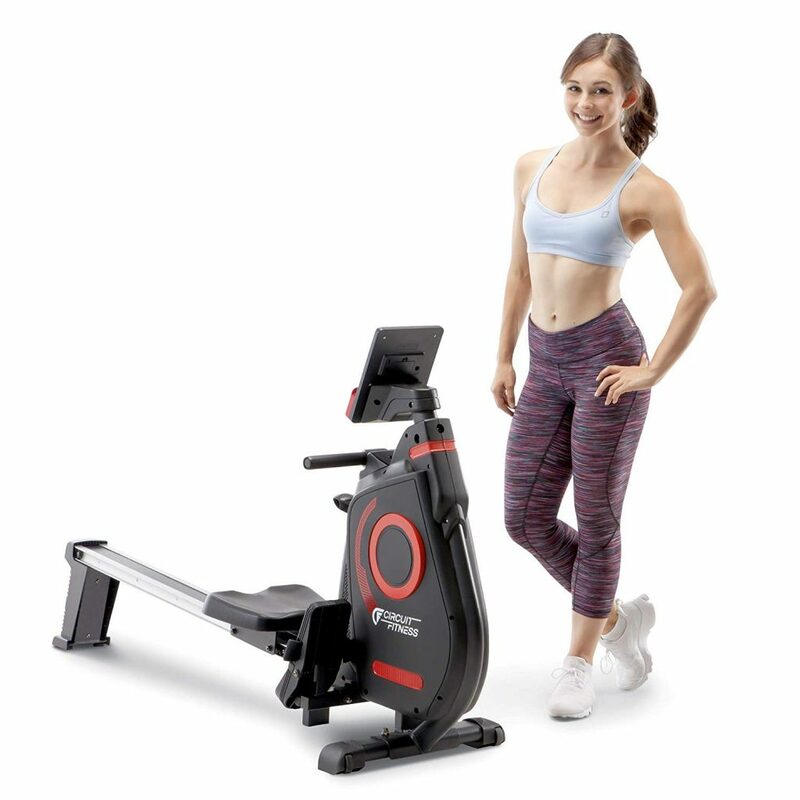 You can expect a great efficient and smooth workout session from this rowing machine with a 9-pound flywheel and increase your cardio endurance by time. There is an adjustable tension lever with 8 levels for you to decrease or increase the resistance or the level of challenge throughout your workout. You’ll find a large media holder just above the multi-angle LCD display, where you can put your tablet or smartphone to keep you entertained and exercise for longer with the distraction of the music or videos. The solid handles are foam covered and ensure a proper anti-slip grip for you to not lose your focus during your session. People at different levels of training can use it comfortably- beginner, intermediate and advanced. You can expect a trouble-free and reliable operation from it for a long time to come. You may need a second person to help you with carrying and assembling it faster. You’ll get the hardware and instructions included in the box but are not straightforward with the labeled parts. Once you put the pieces together (easier with your own tools) you’ll enjoy the great smooth rowing experience. The resistance levels are fine but the highest levels are not super challenging. You’ll still get a decent low-impact workout that is easy on your joints and knees. It is a sturdy and durable rower with a seat that glides smoothly on the frame and a large comfortable foam padded seat, and offers great value for money overall, with only minor cons. It is a great little rowing machine for home use- not for commercial gyms. You’ll get a warranty of two years by the manufacturer and you can have a peace of mind as you can be sure you’re getting something sturdy and reliable.